This glass top cocktail table creates a functional but light and contemporary living room centerpiece. 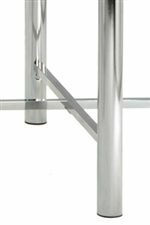 Structure your furniture around this sleek and simple metal and glass table, with crossing leg supports. Pair it with the coordinating sofa and end tables to complete the look. The Nova Glass Top Cocktail Table by Steve Silver at Walker's Furniture in the Spokane, Kennewick, Tri-Cities, Wenatchee, Coeur D’Alene, Yakima, Walla Walla, Umatilla, Moses Lake area. Product availability may vary. Contact us for the most current availability on this product. NV100CT Cocktail Table Glass Top 1 48" 23"
NV100CB Cocktail Table Base 1 20"